A total of 677 pedalcyclists were killed in motor vehicle crashes in 2011, nationwide. The 14-and-younger age group accounted for 9% of those fatalities, and males accounted for 69% of the fatalities among pedalcyclists age 14 and younger. 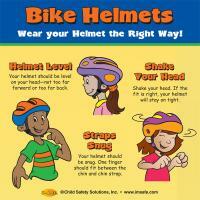 Protect your head, always wear a properly fitted helmet. Assure bicycle readiness by ensuring proper size and function of a bicycle. Ride wisely by learning and following the rules of the road as well as safety tips. Be visible by using reflectors and wearing bright colors. See and be seen at all times. Drive your bike with care and share the road responsibly. Stay focused and alert at all times. Always make sure that you wear a helmet properly. Follow these tips to make sure that your helmet fits properly to help reduce your risk of injury. 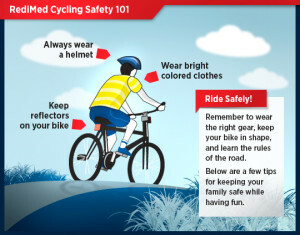 Riding safely and knowing and understanding the laws associated with bicycling are essential for safety. Visit the links below for more information regarding bicycle safety.